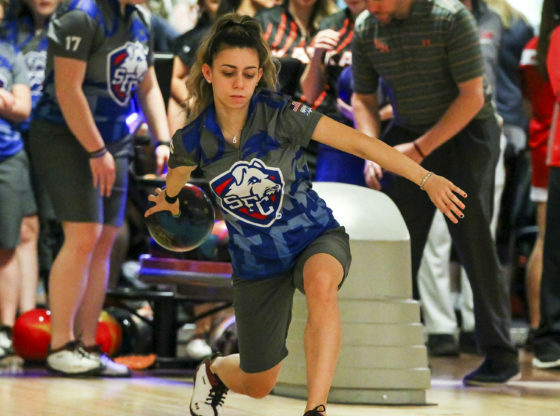 Freshman Taylor Waglione of the St. Francis women’s bowling team has been named the 2019 NEC rookie of the year. This is the first bowling athlete from St. Francis College to win this award as she averaged 19.95 pins per frame during conference play. The 2️⃣0️⃣1️⃣9️⃣ 🎳 ROOKIE OF THE YEAR is… @SFBKTerriers' Taylor Waglione. Taylor finished off the season with a total of 8804 pinfalls and 191.39 average pinfalls per game. The five-time NEC Rookie of the Week and former NEC Bowler of the week finished the season with 14 200+ games including her latest being on February 24th against Mount St. Mary’s during the second NEC tournament. Throughout of the 18 games played in the Northeast Conference this season, Taylor was ranked first in rookies in the NEC and fourth among all bowlers with an overall frame average of 19.95. Since being named NEC Rookie of the Year, Waglione is now the first bowler to be named to the All-NEC rookie and to the All-NEC second team in the same season. “Healthy” Fast Food: An Oxymoron or A Contemporary Phenomenon?